Online physician reviews shape the way consumers view your hospital’s brand, influence patient healthcare decisions, boost local search rankings, and affect how many people click on your hospital when it does appear in local results. But you probably already knew all that. Here are five surprising online review statistics from BrightLocal and National Research Corporation that you probably don’t know—and what they mean for your hospital in 2016 and beyond. 47 percent of consumers say a doctor’s reputation matters. Okay, that’s not surprising. 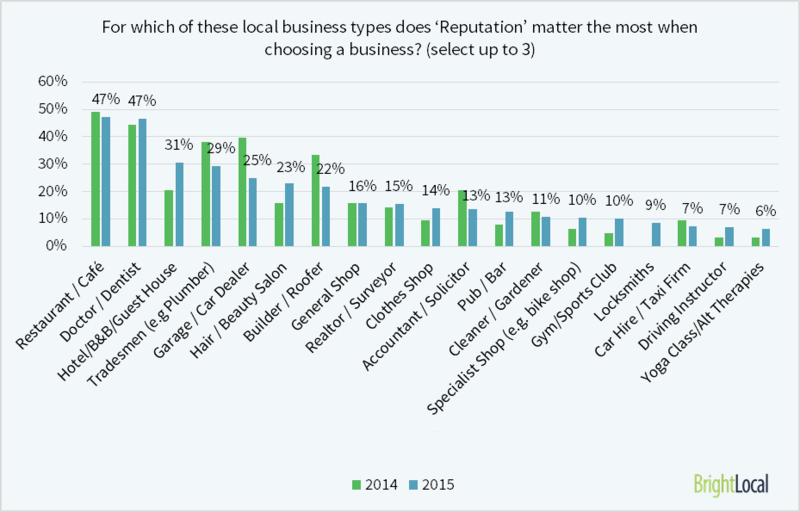 Here’s what is: That percentage is tied with the food industry for #1 among all local business types. Considering the life-changing effects that choosing the wrong doctor for a serious health condition can have compared to choosing the wrong diner for lunch, maybe that shouldn’t be surprising. But when people think of online reviews, most of them probably still think of Yelp and whatever new restaurants they’ve been yearning to try. The importance consumers place on healthcare compared to hospitality industries is a strong indication that doctor reviews are here to stay. The overall number of hospital reviews on sites like Yelp may be a lot smaller than the number of restaurant reviews today, but chances are patients will close that gap in the future. 60 percent of consumers need to read four or more reviews before forming an opinion, but the average physician rating is based on only 2.4 reviews. I’ve written about the inverse of #2 before, but the more I think about it, this perspective seems just as or even more important. Taken together, these two stats indicate that more than half of all prospective patients find the number of available reviews insufficient when they need to choose physicians for themselves or their loved ones. This fact seems to favor health systems that have moved to publish the results of patient satisfaction surveys on their own websites. Because surveys are mailed—or in the best cases, emailed—the number of ratings can be much higher than on commercial review sites. For these systems, ratings are typically only added to physician profiles when 30 or more reviews are available. The larger sample size keeps doctors happier and gives prospective patients a more accurate picture of your hospital’s services. 80 percent of consumers trust online reviews as much as personal recommendations. Word-of-mouth recommendations are generally thought of as the most influential when it comes to choosing a doctor, but this stat shows that most people are just as satisfied with what patients have to say online. That means that the benefit of high ratings could be even greater than you think—as could the harm of negative ratings, even based upon small sample sizes. If an insufficient number of ratings or practices that aren’t patient-friendly are biasing readers against any of your physicians, they’ll probably choose someone else. 31 percent of consumers only trust reviews that seem authentic. Are your doctors worried about fake reviews? They’re not alone. 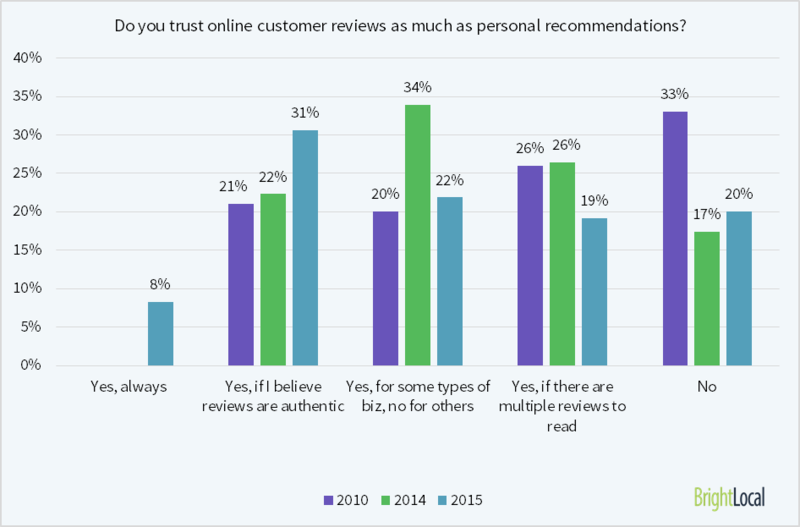 Questions about authenticity are the biggest reason why consumers don’t always trust online reviews, and that percentage is up from 22 percent in 2014. While fake reviews probably aren’t common, most commercial rating sites don’t verify whether feedback is from real patients, and there’s no data showing what percentage of reviews may be inaccurate. This also favors health systems with public patient satisfaction ratings because that data is based entirely upon responses from verified patients. Patients’ desire for more accurate information is going to be what accelerates this trend going forward. For more about this and other hospital marketing trends, download our free ebook, 13 Imperatives for Hospital Marketers from 13 Top Experts.